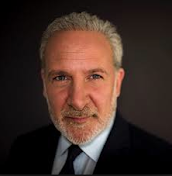 Peter Schiff On The Markets: Stock Market: A Change In Trend? Earlier in the week I made a podcast and I was wondering wether or not the volatility that we were seeing in the markets may have been portending a change in trend and it looks right now that certainly could be the case. The Dow Jones Industrials Index finished down 315 points on Friday to cap the worst week for the Dow in over 3 years.